If you're anything like me, you may have pictured your twenties as the perfect time to figure it all out. You'd graduate, get a job, get married, buy a house, and march happily off into the sunset. And maybe start a family while you're at it. While all of these are wonderful things that do happen for lots of people in their twenties, there are other things that happen in this decade that are different than expected. I'm hanging out here at 26, closer to (gulp) 30 than to 20, and living in the oh so sweet and confusing "mid-twenties". So today, I'm doing some reflecting and sharing five things no one told me about these years: things that I didn't expect. 1. You still don't have it all figured out. Just when you think you're supposed to have your life under control....you're still a major work in progress. Yes, you've likely graduated college or your post-secondary schooling and are in the work force in some kind of job that pays the bills. (Boo for adulting.) You may even be happily married to an awesome guy (like I am). But now you're faced with possible decisions like "Do I stay in this job for the rest of my life?" or "Do I move my family across the country?". And there's also the ever popular question of when to start a family or how long to wait to buy (or stay) in a home. Simply put, we've never really got it all figured out...and we really never will. And that's okay. 2. People have a whole lot of expectations for you...in a variety of areas. Along with the not having it all figured out thing, there's also this weird fact that people will constantly be asking you questions about your "plan", and you'll have some awkward conversations where you may receive heartfelt, well-intended advice that's potentially unwanted. Think back to your senior year of high school when people asked you what you were doing after graduation. It's like that, but on steroids. People are always asking about what's next: with a job, a boyfriend, a hubby, or (the oh so popular) starting a family. I truly believe that people have the best intent in all of this, and I welcome the conversation, but the mid-twenties do feel like this odd time of being asked lots of questions you don't really know the answer to, and then hearing others opinions on it all. 3. You STILL won't feel qualified as a "grown up" sometimes. One of the things that scares me most about potentially bringing a child into this world is just the fact that I still feel like a kid myself half of the time. To some extent, I never want to fully "grow up". But every now and then I wake up with a good hard realization that I'm not a little kid anymore...and I'm not sure how I feel about that. I mean, my mom had me when she was my age. What!? I still feel like I'm 20, maybe 23 max: young and wild and free. It's almost like we're just playing pretend "house", only a less fun version where I have to pay bills and taxes. I will admit though that taxes are not as meticulous as I imagined since there are so many specific calculators for taxes. Any of my twenty-something friends with me? And if you're not twenty something anymore...does this ever change? 4. Comparison doesn't go away after high school or college. I thought that once I left the halls of my 800 person high school that I would be in a world full of far less comparison. And then, college. Once we all graduated, landed jobs, and found our true loves, then surely that would be the end of it, right? Wrong. I think sometimes I struggle more with comparison now than I ever did as a teenager or college kid. 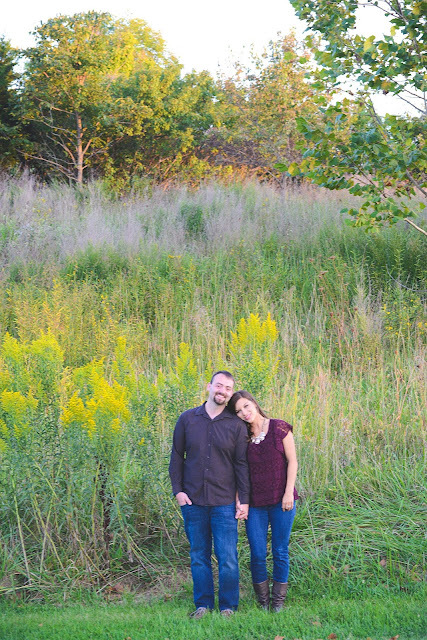 Wedding planning was a huge struggle for me, mainly because I was one of the first to get married, and then I had to question all of my (unimportant) planning decisions as I watched all of my other friends get married. And then there are houses, jobs, marriages, and all of these new things to compare and be jealous of. And I hate that. I'm sure it will only continue with children someday, and I have to continuously focus on being thankful for what I've been given without worrying about what others have. And social media only makes it harder as we all project our seemingly perfect lives. It's time to be real, y'all. But I digress. 5. Time. Flies. And it doesn't slow down. This is the biggie for me right now: life is moving fast, and we only get to do it once. So we better make the best of it. People tell you this from the time you're born...but you just don't get it for a while. Until maybe college. And then one day you get married, and you wake up the next day and you've been married for three years. And you seriously start to have a minor panic attack at 25 because my goodness...a quarter of your life is already gone (if you're blessed to see 100). I know that fear and worry about time going by is no way to live life, but my goodness. I'm sure it only speeds up from here with kiddos! So what to do? Check out this blog's tagline: Learn fearlessly. Love fiercely. Live life fully. That's my motto and I'm stickin' to it. What have the mid-twenties brought to you? What do you remember about these years, and what else were you surprised by? Follow along on Twitter or Instagram to continue the conversation! I'm linking up with Motivational Monday, Modest Mom Blog, What Joy is Mine, Tell it to Me Tuesday, Bliss and Faith, Sweet Little Ones, Testimony Tuesday, Intentional Tuesday, Twinkly Tuesday, Women with Intention, A. Liz Adventures, The Diary of a Real Housewife, Momfessionals,Life in Leggings, and Quintessential Mommy. I don't feel like a grown up sometimes, and I am 31 with two kids! Ha! I feel like that will totally be me some day, Jessica! I feel like comparison can almost get worse! There are so many different directions you can go in and be at in your mid twenties that comparison can easily run rampant. So tru, Alanna! It's hard for sure. We've always got to remember how unique we are and how special that is: just being us! I agree with Alanna-comparison definitely gets worse! I can't tell you the number of times I've thought that maybe I should have done X in my life, only because a friend did it and look how happy she seems on Facebook. The one thing that I've learned is that everyone else is doing the same thing too. That helps me check myself before I spin out of control. Amen to that! It's definitely harder with social media these days I think! I so relate to the "You still don't have it all figured out." because daily I feel so confused and lost for direction, especially when I see my peers excelling quicker than me. It's hard! That is hard for sure! I like that think that it's okay for me to be right where I am, where I'm supposed to be right now. But that doesn't mean I don't look around and sometimes feel behind! I agree with all of the points. Sometimes I wish I could go back and be a child with little responsibilities again. I know I would live my childhood right the second time around! ;) I'm closer to 30 than I am 20, and I thought I would have children by now. Unfortunately, our focus had to shift on other goals/dreams in our life, so growing a family is on the back burner for now. Yes! I was just talking to a friend about how I still feel like older people are adults, and I'm a kid (I'm 26). I never feel quite qualified to be doing big adult things like buying a car or getting married. I am right there with you, Alexandra! In a way, I think we will always feel like that! The last one is so true! Love this post so much! Thanks so much, Cara! Thanks for stopping by! I completely agree! I think that throughout the different seasons, we're allowed to feel unsettled and unsure-- the adult world is definitely not as put together as it seemed when we were younger! That is the truth for sure!!! Great point. We all know that gig is up: adults aren't really all that polished ha! I agree with you that the twenties were a bit uncomfortable for me - I was still trying to gain my footing. Now I am a few months away from 40 (eek) and am curious as to what that decade will hold for me! You're still young and gorgeous :) Here's to a new chapter! These are all so very true especially the not quite an adult yet. At 23 I was a very high ranking manager over 150 employees most older than me. I battled them not seeing me as their child but rather their boss. That's awesome, but I can see how that would be hard at the same time, Mayra! Lots of sides to being an "adult", and they don't always look like we assume! Kelsie, I love this! I completely related to each and every one of these, and it made me feel better. Sometimes, I feel so alone in my awkwardness of being in my twenties that it's nice to know that I'm not the only one! Well thank ya, Annie :) I'm glad it made you feel better- you're totally not alone. I'm hanging out in this stage awkwardly as well ha! Thanks for stopping by! Of all the decades in my life, my twenties is the one that is flying by and not going at all the way I pictured. I can see that for sure, Cori! I hope it slows down a little for you and takes a turn for the best! YES to everything in this post. I feel like even though I'll be 24 in two months, I don't have anything figured out and it's super frustrating. I know that I still have so much time, but it seems like everyone else has their stuff figured out! Or at least....they are good at faking it!! Thanks, Chels! You're so young still :) I think your'e exactly right- people are "faking it till they make it" in so many stages and ways! We have hope! Yes to all of these!! I am going to be 30 next month (gulp) and I still feel like there are so many things that I do not have figured out. I feel like I should have it all figured out because I am "an adult" but I just don't. I get the questions about when am I going to get married and have babies. I think it's because my boyfriend and I have been together for almost 6 years now. I am still on the fence about starting a family. I'm not really sure if I want to have kids. I also don't always feel like I am a grown up. I don't think comparison will ever go away really. There is always going to be something that we are comparing ourselves too,etc. Time truly does fly by. I remember being younger and wanting to be a grown up. Why? I would so love to go back to being a kid again. Great post! Thanks for sharing your heart, Mistie! There is so much that's unknown, and I think that's across a lot of ages. I loved being a kid, and have truly enjoyed all stages of life. It's just weird how put together I thought people were at my (current) age back when I was younger. Seems like we really don't know it all...and never really will. Best of luck to you on big life decisions! Amen to that, Shaylee! I feel you girl, and I would say you are not alone at all! I agree with all of these. I'm currently struggling to "figure myself out." I'm dreading the day when people start asking me about children. I'm getting married in June and my fiance's mom told me that my mom thinks/hope I'll have kids right away. I could've screamed! I can see that for sure- "figuring ourselves out". I'm sorry you're already getting the "baby" question. I wrote a post on that recently you should check out. Congrats on your upcoming wedding- marriage is the best and don't let anyone tell you otherwise! great article girl. i'm almost 30 and im still trying to figure it out! Thanks so much, Caitlin! I think we may all never figure it out ha! I still feel this way.... and I'm now in my thirties!!! Ha! I'll be there soon, Mary! Thanks for sharing! I was married at 21, house at 23, first child at 25. I didn't really even start to figure it out until 28. I'll be 30 in just under 2 months and am finally (mostly) comfortable in my own skin. I still don't feel like an adult half the time. Sometimes my daughter will be doing something naughty and I wonder who's going to take care of it...until I remember it's me! Agreeing that comparison can get worse, and more so once you have a child. I think the internet can play a big part in that. This is so great, Julie! Thanks so much for stopping by and for sharing your heart and wise words! I love that idea of being calm and more comfortable in our own skin as time moves on. I pray that for a whole lot of us commenting on this post :) Happy almost 30th!! I just found your blog but I agree so much with all of this! I'm 23 so I don't know if that qualifies me really haha but I do not feel like a grown up at all. And like you said, I never really do. I sometimes stress out when people ask me if I'm going to live in my town forever. How am I supposed to know!? Haha I like it right now but the thought of being here for 60+ years is stressful haha. I'm so glad you stopped by, Amanda! You qualify for sure ha. Yes, you don't have to have it all figured out right now, and you really shouldn't ha! Enjoy it- time goes fast for sure! This post is SO relatable!! I agree 100% with everything you said, especially with still not feeling like I qualify to be an "adult" haha. We totally thought we would have our life together by now but little did I know my life would just start to get crazy. Thanks girl! I agree- it just gets crazier and more confusing. Boy is this comforting! I'm 23 right now and I know this is time to not worry and just do whatever, but I'm a substitute teacher, which throws me into the "responsible adult" role every single day... and like you, I feel like a kid still! It's nice to know that it's just going to always be this way... sort of. Haha! Thanks for sharing this, I really enjoyed reading! I'm so glad you found it relatable! It will kind of be like this forever, I'm thinking! So glad you enjoyed reading it- thanks for stopping by! Sounds like a common theme I'm hearing, Nikki! Thanks for sharing! I am turning 30 in a couple months and I still feel all of these things! Not feeling "settled" and feeling "behind" compared to others is the worst! Yes, most definitely! I hope that your thirties are your best years yet. I think to some extent we will always feel some of this! Time sure feels like it goes faster the older I get. I think we put so much pressure on ourselves to have it together, like that's a thing that just happens when you're an adult. I think most people don't feel like they have in together no matter how old they are. I'm trying to just take life as it comes and make the best decisions for me and my family. Agreed, 100%! We do put so much pressure on ourselves, when really we are all in the same "not-put-together" boat. Sounds like you have a great approach! I am 21, living in a home and still in school. I definitely know that I don't have everything figured out, but that's okay. Just take one day at a time. That's a great outlook on it, Amanda! You are not in this world to meet my expectations about you"
And that changed so many things in my life! That's so great, Veronica! Thanks for sharing! This post is so accurate. I'm only 24 but I am feeling these feelings for sure. Thanks, Jenny. I know what you mean! 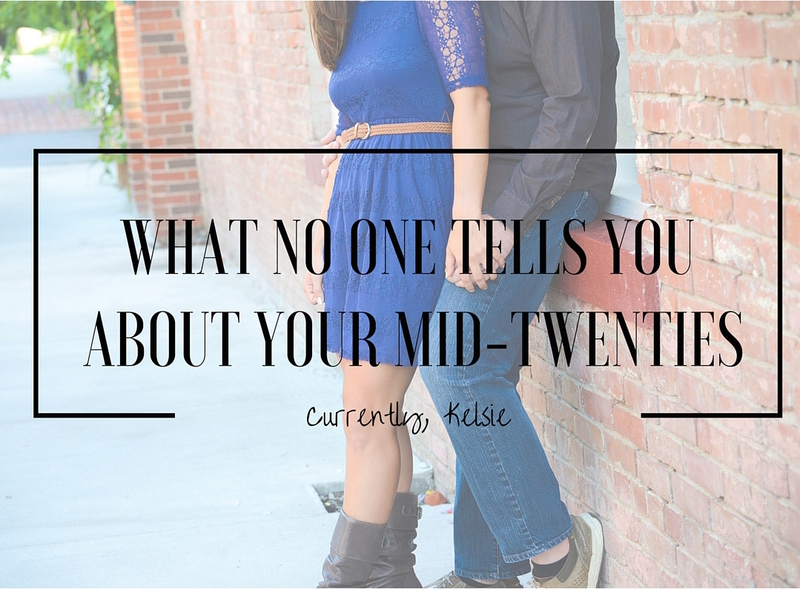 I'm heading to my mid-twenties and I'm definitely feeling all of these! I love love love this! I am 24 (turning 25 in August) and I feel like no matter what I am doing in life or where I am, family members are always asking "what's next" or "that is what you're doing" (condescendingly, of course) I just want to yell and tell them that although I might not be doing what they think I should, I am happy. I definitely don't have it all figured out-hell, I probably don't even have 10% of it figured out but so what? I also don't adult as much as I should/could but I am still breathing so I guess I am not that poor off! Thanks so much, Sarah! You're totally right. I think you're doing just fine! For sure! Glad you're enjoying it! Yes! But I hate to say... since I'm in my late twenties, and I can still completely relate to all of these...I'm thinking they might be lifelong. I know what you mean, Abby. I have a feeling they are life-long as well. I am 31 now and I still don't have things figured out! Hoping my 30's bring more clarity. But I couldn't agree with all your points being in your mid 20's! Thanks, Chrissa! Hang in there, girl :) Hope the 30s are the best decade yet! These are so personal for me! I'm turning 24 next mo tha and I can SO relate! Totally. You're such a cute little mama! Thanks for such a personal and genuine post...based on all the comments, it sounds like most of us are in the same boat of not having it all figured out, not meeting certain "expectations" by a certain age in life, but the beautiful part about the whole thing is that it doesn't matter. You are your own person and it's your life. These "standards" and "expectations" are not real, don't rob yourself of your own joy just because you feel like you're not at the same level everyone else is - you have to feel comfortable in your own skin and you have to take your time to really discover what you want. If you're not ready for kids or don't want kids, then don't have them until that changes..it's not based on what "everyone else" is doing. I believe it's all about your mindset, and your feelings, your dreams, hopes, desires are what make you YOU. I agree, Monique! Thanks so much for sharing such wise words!! You summed up what being in my mid-twenties really feels like. If someone says to me, "So you're just a supply teacher," one more time I might just lose it. Thank-you for such a well written post! Thanks so much! I am enjoying them as much as I can! Oh life, what are you doing to us all!? Be kinder to us already. Thanks Kelsie for sharing such a wonderfully personal post. In my mid-twenties, I had just moved from the biggest regional city in my home state to the capital city (I was 25 turning 26). I was excited about the new life ahead of me, but knew it would be a hard slog: I'd finally realised that I wasn't happy in my marriage or job (I had a mortgage by the time I was 21, married by the time I was 24, and when I finally got the courage to leave my unhappy and unhealthy life, I was not quite 25) so I packed up and started afresh in Melbourne. I learned that there is no such thing as going to university too late - I started uni in 2011 (26 turning 27) and graduated last December. I met the love of my life on 4 April 2010. Yesterday we celebrated 6 years of being together but it's not our anniversary any more as we got married in August 2015. We're expecting our first baby in just 13 short weeks. I'm almost 32 and I can honestly say that I've never been happier as an adult than what I am today and have been since meeting my husband. If there is one thing that my mid-twenties taught me it's don't let yourself get caught in a life you don't love. We are the makers of our own destiny, and although the alternative may seem much harder, going through life unhappy is even worse. And as for those naysayers and people comparing you to your siblings/colleagues/friends from high school/uni, ignore them, they'll give you a complex. Amen to that! Thanks so so much for sharing your story and your heart! It means the world. I'm so glad you're loving this stage of life so much- you rock! And you'll feel the same way when you're in your late 20s too! Will we ever figure it out? Haha! I have a feeling we may not, Nicole! This post resonated with me so much! I'm 27, dating the love of my life, looking for a house to move into, and having a total quarter life crisis career-wise! It turns out that just when one thing falls into place another goes totally awry. Thanks for the reminder that that is okay! Love that! I think I may never grow up! Thanks so much for the encouragement and link, Sue! I love Relevant Magazine! I'm 27 and feel all of these exact feelings! I feel like I'm just barely holding on and constantly trying to catch up. I can't even imagine what it's like when kids are in the mix!